Casseroles are sweet, meat, vegetable. They are easy to prepare and useful for dietary and baby food. Try to cook a casserole of potatoes and minced meat. This hearty dish can be a delicious dinner for your family. Clean the onions from the husk and finely chop with a knife or in a blender. In a frying pan 2 tablespoons of sunflower oil, rascality it to much heat, carefully put the onions and fry it until Golden brown. Put in the pan with the onions minced meat. Fry the beef for 10 minutes over high heat, stirring occasionally. Then add a little boiled hot water, salt and black pepper and cover skillet. Fry the minced meat on low heat until complete evaporation of water. Hard boil 3 eggs. Cool them and peel off the shell. Finely chop eggs and add in the fried minced meat. Mix thoroughly. Rinse under water to the potatoes and peel them. Put in a saucepan, cover with water, add salt and cook over heat until fully cooked. 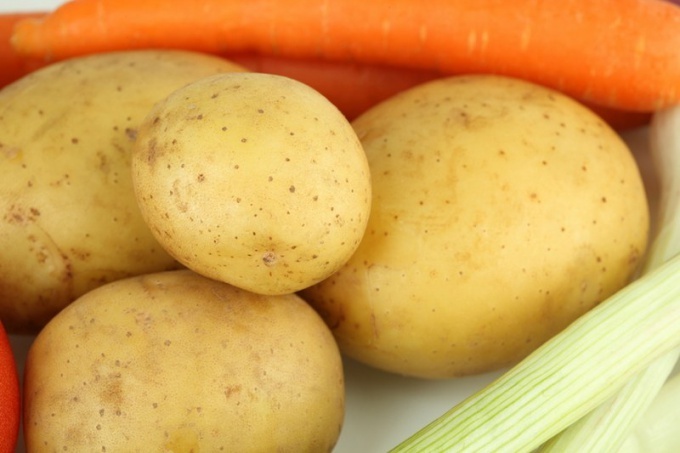 Boiled potatoes place in a deep bowl; add piece of butter and using a blender make a puree. Break into a deep Cup 2 eggs and whisk them with a mixer. Add the milk and mix thoroughly with the beaten eggs. Add the resulting mass to mashed potatoes. Whisk puree with a blender. Take refractory form and grease it with some butter. Divide the mashed potato into two parts. Put in the form one portion of mashed potatoes, then put the fried minced meat with eggs. Then put the second part puree to the mince and flatten with a spatula. Grease casserole chicken egg yolk and put in preheated oven. Bake the dish for 45 minutes at 170 degrees. The finished pudding cool down a bit. Cut it into pieces and serve. Sprinkle on top the casserole with finely chopped green onions. 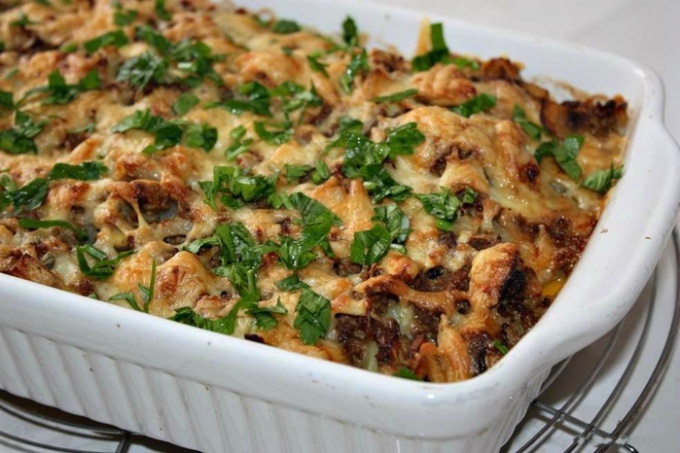 To take casseroles stuffing, composed of equal parts of lean pork beef. Someone prepared, and someone may not, potato casserole with ground beef. But from childhood to almost everyone I remember the taste of this dish. This delicacy was fed in kindergarten, the aroma was heard before lunch. bread crumbs – 2-3 tbsp. Potatoes wash, peel, boil in salted water. Pork and beef cook the meat. Onions clean and finely macrosite. Then pan fry with vegetable oil. To fried onion add the minced meat. Extinguish all together until to evaporate the moisture. At the end of cooking add salt to taste. From the pan with boiled potatoes drain. Add to the potatoes the milk and butter, heat until hot. Well mash the potatoes with the butter and beat in egg. Form for casseroles grease. Lay the first layer half of the mashed potatoes. Then put all the mince. Smooth, lightly pressing down the meat. Then put the remaining potatoes, too giving. In the oven heated to 200°C. soak the casserole until Golden crust. The finished dish is cut into portions, pour sour cream and sprinkle with herbs. If desired, the casserole to grease with a yolk, the result is a more beautiful crust. Casserole of beef and potatoes cooked in the oven for this recipe, always turns out incredibly tender and juicy. Preparing this dish quickly and easily, with products that are almost always available in the fridge. - greens (you can use both dried, and fresh). The first step is to wash the potatoes, put it in a deep pan, pour water and put to boil. If the vegetables are large, the previously they can be cut in half so they cook faster. Ready potatoes cover with cold water and leave for 10 minutes to cool. Next you need to peel the onion and chop it chop. Preheat Tolstoganova pan, pour oil and fry the onions to a nice Golden brown. During frying onions should be constantly stirred, so that it is in any case not burnt. The next stage is roasting of meat. The stuffing need to put in the frying pan to the onions, mix everything, add salt and pepper to taste, add chopped greens and fry on high heat until soft. It is worth remembering that at this stage the most important thing - to quickly fry the meat to make it feel crusty. Potato peel, wash and grate on a coarse grater or finely chop. Grate in a separate bowl the cheese. Once all the ingredients are prepared, you can start collecting casseroles. The pan needs to be oiled and put on it the mince, flatten it. On top of the meat put the chopped potatoes and salt it. Next, in a Cup mix the sour cream (cream) with dill and salt, mix well. Prepared sauce pour over the casserole and sprinkle the top with grated cheese. Put the baking pan in the oven for 30 minutes, pre-heating the oven to 180 degrees. Juicy and hearty casserole is ready.